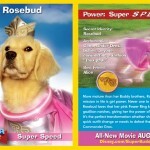 Super Buddies brings the Puppy Power! Air Bud was a great dog, he was Comet on Full House and he was wise enough to know there was no specific rule against dogs playing basketball. And though he is long dead, his legacy lives on in the annual Air Buddies movie. 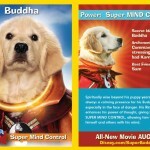 The latest entry, out today on BluRay, DVD, and VOD, is Super Buddies. 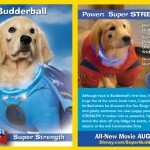 And, yes, that means super hero puppies! 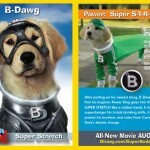 Watch the fur fly as a new breed of super hero is born in Disney’s fun-filled epic adventure. An ordinary day at Fernfield Farms turns extraordinary when Budderball, Mudbud, B-Dawg, Buddha and Rosebud discover mysterious rings that grant them each a unique super power. Before you can say, “Buddies, assemble,” the pups unleash their amazing abilities and race to the rescue when a shape-shifting bully from outer space threatens the planet. But can they succeed in kicking major tail without revealing their new secret identities? Yes, super puppies vs a space pig. Also there is a mentor character, Captain Canine, who looks like Beethoven making a secret cameo. I know what you’re thinking: “Tars, I love this Buddies crap. 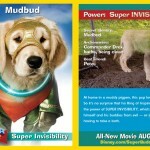 But I really want commemorative cards of each of these Air Buddies super heroes!” Well, you are in luck, so check out the gallery below! Also the trailer, because talking green space pigs are worth it for that alone!